Albert 'Chapi Ferrer', the manager of the Barça Legends, has released the names of the 18 players who will dress for Friday's match versus the Mohun Bagan AC Legends in Kolkata, India. Kickoff at the Salt Lake Stadium (officlally known as Vivekananda Yuba Bharati Krirangan, or VYBK) is set for 7.00pm local time. This will be the eighth match for Ferrer as coach of the team of former Barça players. The match has been organized by the Football Next Foundation. The former Barça players Robert Fernández, Roger Garcia and Fernando Navarro are the new faces for this Barça Legends match. The rest of the list is as follows: Jesús Angoy, Albert Jorquera, Xavier Sánchez Jara, Frédéric Dehu, Juan Carlos Rodríguez, José Edmílson, Juliano Belletti, Simao Sabrosa, Jari Litmanen, Jofre Mateu, Andoni Goikoetxea, Gabri Garcia, Javier Saviola, Pedro López Martínez Landi, and Damià Abella. Under Ferrer, the Barça Legends have racked up five victories, a draw, and a defeat. After winning in Mozambique against the Mambas Legends, 1–0, Barça had a 2-2 draw with Manchester United, and a 3-2 win over Hristo Stoichkov & Friends last September. In April, the Legends traveled to Brazil, where they beat the Seleçao Pernambucana, 1-0. Barça then went to France, where they beat the Le Havre AC Legends, 3-1, and Olympique de Marseille, 3-0. 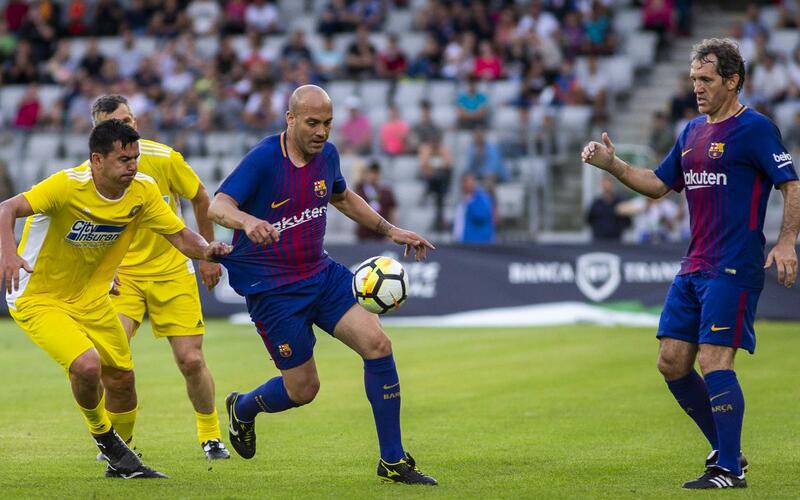 The Barça Legends' last game was played in Romania, where they topped the Romania Legends, 2-0. Barça is now continuing to schedule matches to help take the Barça brand and its values around the world. Apart from the game in Kolkata, various institutional and commercial events are planned, as well as an activity with the Barça Academies that the Club has in the Indian cities of Delhi and Mumbai, which will be attended by the Argentinian Javier Saviola. The match against the Mohun Bagan AC Legends in India can be followed on Barça TV, Barça Video and Barça's official YouTube channel.